The latest data on the Aussie jobs market appears to be all good news, that is, unless, you’re employed in the media and advertising sector. According to recent statistics into the Aussie labour market, 2017 was the best year on record for new job creation. But new data from job search platform Seek paints a much bleaker picture for people employed in the “advertising, media and arts” sector. Which is probably you! According to Seek, media/advertising job advertisements fell a whopping eight per cent year-on-year in the period of November to January 2018. Taking a look at the graph below, of all the employment sectors, media/advertising was the only category in the red. According to the Seek data, all Australian states had a significant rise in vacancies when compared with this time last year. Although the stats didn’t include media positions. 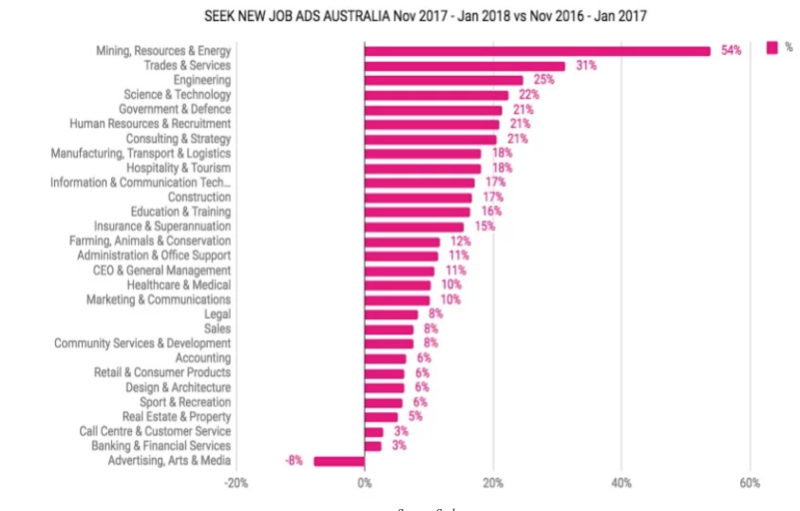 Interestingly, the typically two underperforming states – Tasmania and South Australia – had the biggest increase in job advertisements over the past 12 months. Up 26.4 per cent and 22.8 per cent, respectively. West Australia also appears back in the game with job ads up 18.6 per cent on the back of a 54 per cent increase in jobs ads for people in the mining industry. Commenting on the results, Seek’s chief commercial officer, Kendra Banks, said: “The strongest sectors overall are mining, resources and energy, trades and services, engineering and science and technology. “We’re seeing a strong national demand for STEM skills — science, technology, engineering and mathematics — which reflects a global talent shortage. “This has been identified by Australian CEOs as one of their top business risk areas, but it also creates huge competitive job opportunities for Australians with engineering and IT skills,” Banks said.